On October 16, Abrams Press will release Monsters Of The Week: The Complete Critical Companion To The X-Files. Written by A.V. Club contributor Zack Handlen and former A.V. 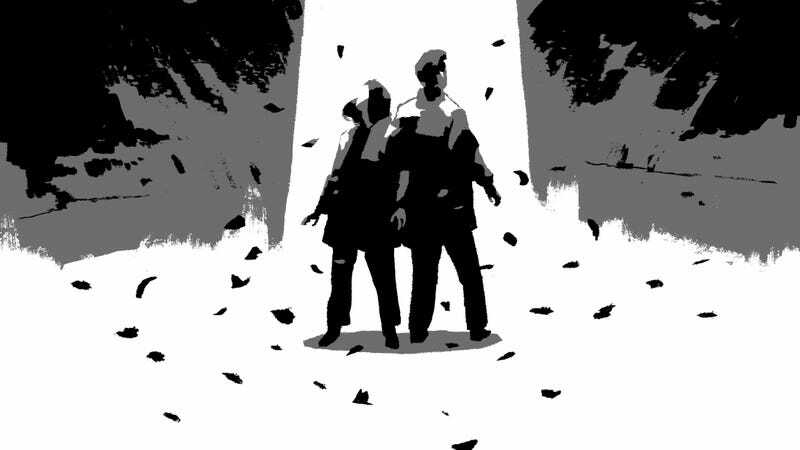 Club TV editor Todd VanDerWerff, the book adapts and updates the duo’s popular TV Club Classic recaps, supplementing them with cast and writer interviews, illustrations from Patrick Leger, and a new foreword by X-Files creator Chris Carter. Read on for Zack’s take on season five’s “Bad Blood,” followed by commentary from the episode’s writer, Breaking Bad and Better Call Saul’s Vince Gilligan. Monsters Of The Week can be ordered here. Four and a half seasons into The X-Files, the characters of Mulder and Scully are pretty static and predictable. With each new episode, we know Mulder will believe everything he hears and have a crazy theory that explains all of it; we know that Scully will cling to rationality and common sense in the face of all evidence; we know that Mulder will almost certainly be proved right; and we know that Scully will put up with pretty much anything. One of the strengths of a long-running series is the way the audience’s familiarity allows the writers’ room to play with our assumptions. What must it be like for Mulder to have to put up with a partner who never agrees with him? And what must it be like for Scully, working with a guy who seems to believe in everything? “Bad Blood” is one of my favorite X-Files episodes. It’s goofy in the best way possible, offering a welcome respite from some of the heavier subject matter of the season. Like many of the series’ strongest comedic entries, “Bad Blood” is a genial self-parody, lovingly pointing out our heroes’ flaws in ways that only serve to make them more human. The humor derives from how Mulder and Scully see themselves and each other, and how both of their versions of the truth work to reinforce their ideas of who they really are. It doesn’t hurt that their latest investigation reveals that some monsters are just as invested in self-image as the rest of us. After learning about a series of cattle exsanguinations that escalated to the murder of a tourist, Mulder and Scully head to Cheney, a small Texas town. There they meet Sheriff Hartwell (Luke Wilson, at his Luke Wilson-est! ), Mulder tries to prove his wild theory about vampires (which is correct), and Scully does autopsies, firm in her belief that they’re dealing with a killer who’s read Dracula one too many times (this is also correct). Mulder is attacked, Scully arrives just in time to save him, and then Mulder chases his assailant—a teenage pizza delivery boy—into the woods, where he stakes him in the chest. This leads to a horrifying moment for both our heroes (and the audience) when Scully removes the kid’s fake vampire teeth. It’s one of the best cold opens in the show’s history, one that plays on our expectations and our automatic assumption that Mulder ultimately knows what he’s doing. While in medias res beginnings don’t always work, the surprises this one holds—from the sudden twist (those plastic fangs!) to Mulder’s “Oh sh—,”— it’s clear that we’re in for something different from the normal hunt for monsters and ghouls. It all turns out OK, of course: the kid, Ronnie, really is a vampire, and when the local coroner removes Mulder’s stake, he pops back to life. He’s part of a community of bloodsuckers (a community that includes Sheriff Hartwell), and when Mulder and Scully return to Cheney to investigate the disappearance of his “corpse,” that community pulls together to protect one of its own. Ronnie may be an idiot, the sheriff explains to Scully, but he’s their idiot, and the episode ends with the vampires driving their RVs off into the night, leaving behind a pair of dazed, possibly wiser, and undeniably relieved FBI agents. It’s not the most dynamic of plots, and Mulder and Scully are even more irrelevant to the action than usual. But the idea that all this happens because a kid vampire breaks the rules of his kind is a creative premise. Throughout the series, Mulder and Scully spend much of their time hunting creatures that are essentially anomalies in the social order, viruses in the system, and purveyors of bizarre deaths. They typically aren’t “pleasant people who pay their taxes on time,” so it’s nice to see ones that are, and do. Like “Jose Chung’s From Outer Space” (S3E20), “Bad Blood” is a Rashomon episode, in which multiple characters explain their version of the same events. Unlike Rashomon, however, Mulder and Scully’s accounts don’t differ much on facts—the differences are in the details, and “Bad Blood” gets a lot of laughs out of exaggerating how far each character will go to make themselves look good. In Scully’s version, Mulder is an endless trial, while Scully is the long-suffering grown-up forced to put up with his foolishness, even as she makes eye contact with the dreamy local lawman. In Mulder’s version, Scully is dismissive and close-minded, ignoring his insight while she flirts with the bucktoothed idiot sheriff. While it would’ve been possible to make this episode as brutal and conceptually terrifying as Rashomon really is (if there’s no such thing as objective truth, how does anything mean anything? ), “Bad Blood” keeps things light. What comes across most clearly is the sense of how long-term relationships settle into routine overtime. Like any couple, Mulder and Scully have formed narratives of how they fit with each other, and those narratives affect how they see the rest of the world, which can be healthy—we need the continuity—but can also be limiting. In Mulder’s mind he is the enlightened and noble seeker of truth (and tired of being doubted); in Scully’s she is the ever-patient (ever put-upon) heroine, logical and competent. Mulder and Scully might’ve put together the case faster if they weren’t so busy editing events in their head to fit how they want to see themselves. Mulder and Scully aren’t the only ones trying to make themselves look good. Ronnie puts in vampire fangs and menaces cows and tourists, clinging to horror movie clichés about what it means to be a vampire because he thinks it makes him look cool. The kicker isn’t that he really is a vampire; it’s that the whole town is made of creatures just like him, bloodsuckers smart enough to know that the only way they can survive in the modern world is by making sure the world doesn’t see them as a threat. The locals who keep Mulder from killing Ronnie in the end are arguably the clearest thinkers in the whole episode—they’ve figured out the only story that keeps them alive, and, occasional idiots like Ronnie aside, they’re doing a great job telling it. You could go the despair route with this. If we’re all our own main characters in our stories, then on some level, we’re never going to see eye to eye on anything. But maybe that’s not so bad in the end. I don’t argue that “Bad Blood” is trying to make some profound existential statement, but I do think there’s something to be said for the pleasure we get in seeing how those separate stories collide. That’s the real joy of art: the attempt to communicate your own, specific, unique, never-to-be-repeated view of the world to others. And maybe that’s the most we can hope for in real-life relationships: that we agree on the basics but take pleasure in noting the discrepancies. That’s how I see it, anyway. When asked what made Mulder and Scully such compelling characters to write for, Vince Gilligan says he was interested primarily in their dynamic: “To me, it was the tennis match that occurred between them. These were two really smart characters who had their own view[s] of the world and their own various areas of expertise but they were both whip‑smart and both respected and even loved each other… There was always a deep respect and affection between them and they were both just really interesting to write for in the sense that on the best days and in the best episodes, there was a real argument going on between them. Mulder would have his point of view about what was going on and it would be. . . an otherworldly explanation. . . and Scully would have her explanation, which was much more grounded in reality. “Keeping that tension, that romantic tension—that tension of argument, so to speak—going was one of the hardest parts about the job, in that you wanted them in a perfect world to both have equally compelling arguments. . . . You wanted that tennis match between two excellent tennis players, where the ball gets lobbed across the net and then it gets returned beautifully and it’s always in play, back and forth, back and forth, your head is going left and right and left and right watching this ball get knocked back and forth—this argument gets kicked back and forth, and you’re impressed with it at every turn. That was easier said than done; we [the writers] had a real hard time doing that in practice, keeping that argument going, because a lot of the time the plot at hand in any given episode was so out there that there really was only Mulder’s explanation. The X-Files: "Bad Blood" / Millennium : "Luminary"